Kobzar (literally the ‘kobza player’ or ‘minstrel’). Originally the title of the first collection of poems by Taras Shevchenko, consisting of eight poems, mainly Romantic ballads, published by P. Martos in Saint Petersburg in 1840 (the most recent offset facsimile in 1976). The title has, with time, been applied to Shevchenko's poetic works in general. It has acquired a meaning symbolic of the Ukrainian literary and national rebirth because of the national spirit of Shevchenko's poetry and of the fact that two other editions of his works incorporating the title ‘Kobzar’ but including newer works appeared during his lifetime: Chyhyrynskii Kobzar i Haidamaky (The Chyhyryn Kobzar and Haidamaky, Saint Petersburg, 1844) and Kobzar Tarasa Shevchenka (The Kobzar of Taras Shevchenko, Saint Petersburg, 1860; an offset facsimile appeared in 1981). 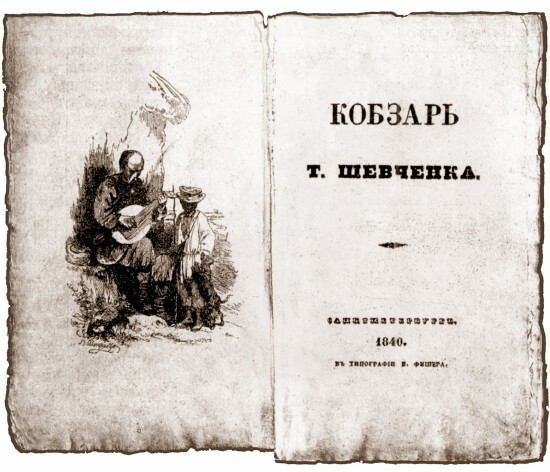 Shevchenko's exile, when he was forbidden to write, and the strict censorship of his poetry made it impossible for a complete edition of his works to appear until after his death. Subsequently many editions of Kobzar were published, each of which included previously unpublished poems. The most notable are the Osnova (1861–2) and D. Kozhanchikov (1867) editions. The Ems Ukase (1876), which prohibited publications in Ukrainian, brought about the first editions outside Russia-ruled Ukraine—Oleksander Rusov's (Prague, 1876) and the Shevchenko Scientific Society's (Lviv, 1893). However it was not until 1907 that a relatively complete edition appeared, in Saint Petersburg under the editorship of Vasyl Domanytsky (2nd edn, 1908; 3rd edn, 1910). Attempts at publishing a complete and definitive version resulted in the five-volume Kyiv–Leipzig edition (1918–21); the first Soviet ‘canonic’ edition (edited by Yarema Aizenshtok and Mykola Plevako, 1925); the first academic edition (edited by Serhii Yefremov and Mykhailo Novytsky, vols 1–2, 1927; vol 3, 1929); and the first ‘full’ edition in 14 vols (vols 2–15), edited by Pavlo Zaitsev and published by the Ukrainian Scientific Institute in Warsaw (1934–7, rev edn in 14 vols published by Mykola Denysiuk Publishers, Chicago, 1959–61). In Soviet Ukraine there appeared a censored jubilee edition (edited by Volodymyr Zatonsky, Andrii Khvylia, and Yevhen Shabliovsky, 2 vols, 1935, 1937) and an equally ‘selected’ academic edition (edited by Oleksander Korniichuk, Pavlo Tychyna, Maksym Rylsky, et al, 5 vols, 1939). During the Second World War a jubilee edition under Leonid Biletsky's editorship had been prepared, but only one volume appeared, in 1942 in Prague; the remaining volumes were issued as a revised edition in Winnipeg (4 vols, 1952–4). A full but censored Soviet 10-volume academic edition was published under the editorship of Oleksander Biletsky (1949–53). It was not until the six-volume collected works of Taras Shevchenko were published in Kyiv in 1964 that the first full, uncensored edition of Shevchenko's poetry appeared in Soviet Ukraine. Thus, censorship of Kobzar has taken various forms, from outright prohibition in Ukraine under tsarist Russia to selective cuts or the use of more suitable variants and tendentious explanatory notes under the Soviet regime. Kobzar has been translated into all of the world's major languages. The most comprehensive English version appeared in Canada as The Poetical Works of Taras Shevchenko: The Kobzar (translated by Constantine Andrusyshen and Watson Kirkconnell, Toronto 1964).